← “It’s been an amazing adventure from day 1,” says ECR’s Traffic Guy as he celebrates 30 years on air! Sun, sand, sea!! !This is what comes to mind when thinking of this beautiful East Coast city. This is the first time we will be showcasing our home city and though it should be the easiest, it’s actually the most difficult thing to do as there is so much to say about a city we love so well. Durban often gets a hard rap in the press due to its ‘crime’ rate and often the city gets judged by poor attendance at concerts and events, but to me, there is no city more beautiful or offers as much as Durban. Sure, there is no mountain, but so what, the Drakensberg is but a stones throw away and the weather is so much more predictable, our water is so much warmer and sure, there are no vineyards but that is exactly what makes us different. So what made us choose Durban? Well, it was after a recent trip abroad where almost everyone had heard of or knew Johannesburg or Cape Town but not too many knew Durban. 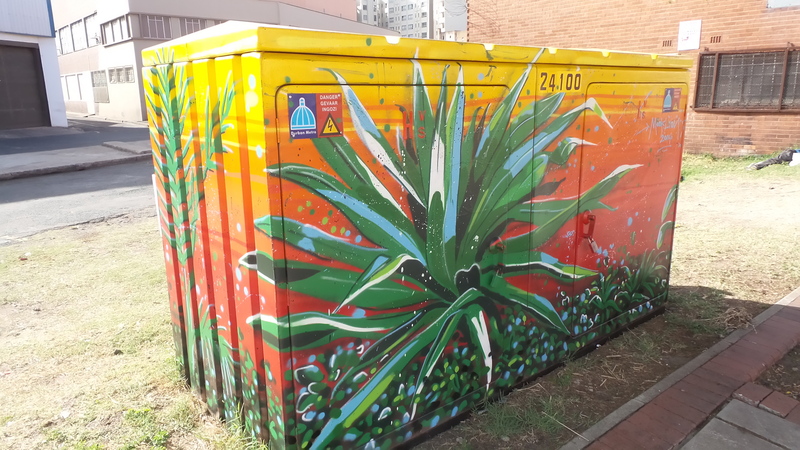 Durban’s culture is vibrant, colourful and alive…there is such diversity in the city. Our Indian population is the largest in the country, Our beautiful Zulu nation adds the drumbeat to the city and our legacy of being the last ‘British” outpost makes us pretty unique in the make up of the race landscape. This means that our way, is vastly different to the rest of country. Durban moves at a different pace, should you want to meet a Durbanite at 12 you should tell him 11. We are a surfing community, we’re passionate about our sport and we relate to each other in a more casual less stilted way. Of course, a lot of this is changing and we do have that segment that knows all about wine, or can tell you all the sophisticated names of food but by and large, Durban’s community is far more relaxed and we love a good ‘braai’ with beer and a group of friends or if we go out to eat we prefer the bistro chic, easy to eat kind of food because for us, it’s more about the company, being able to laugh, loud in a relaxed space. We love to socialise around food. That’s not to say that’s all there is. We have great experiences to offer so we share some of our favourites with you. Whatever your preference there is something to suit every taste. Our food scene is growing in leaps and bounds as the palate of Durbanites becomes more sophisticated. This is due largely to the success of local chefs such as Duke Garraty , Shaun Munro, Kevin Joseph and Gavin Van Staden to name but a few and of course the food channel. More and more restaurants are offering a culinary experience rather than just a plate of food. For fine dining of the highest culinary order: Mundo Vida in Umdloti, The Fig Tree at Simbithi and Bel Punto in Umdloti are five star. For the Best Curry in Town: Durban and curry go together and of course Durban is the home of the bunny chow and there is no other place to try one than Hollywood Betting in Argyle Rd (we know its an unlikely place but just try it) or Goundens in Umbilo. Sure, there are many places who offer the same thing, but these are our choices and as locals this is where we go for curry heaven. Durbanites are guilty of one thing, we have been slow to react to the cosmopolitan and much more integrated lifestyles of our sister cities Cape town and Johannesburg when it comes to the nightlife, but there is a simple reason for this. Music, our tastes are pretty different. For example, The Chairman in Point Rd is a stunning venue with class acts every week but has mostly Black patrons, Cottonfields in Umhlanga has mostly white and Coloureds and Indians prefer Dance Cafe, but this is not a bad thing. People go where they enjoy a certain style of music, though this too is changing, with places like Skyy, offering entertainment of crossover appeal .In everything else we are pretty much a mixed society with similar tastes , just not necessarily music. We love our markets and the latest development in the CBD at 8 Morrison Street, The Morning Market, part of the “Rivertown” district, has become hugely popular in its short life. With organic fruit and vegetables on sale, artisanal delicacies all around and the sound of the sax floating in an out with the breeze, this once unloved 1905 warehouse is a tasteful combination of food and art. The I Heart market at the Moses Mabhida stadium is also one of our favourites, everything is handcrafted or handmade . A great way to spend the first Saturday of every month. 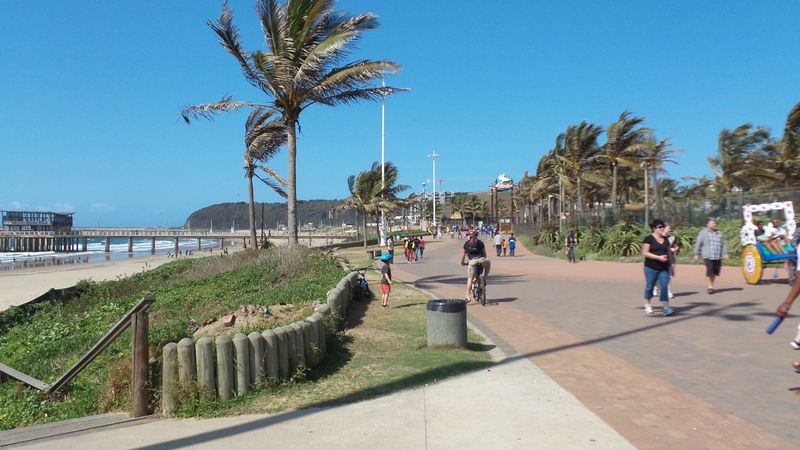 THE BEACH: Our beautiful beaches have been completely transformed with the addition of the promenade that extends all the way from uShaka to Blue Lagoon. You will find everyone from families to skateboarders to athletes enjoying a stroll or an ice cream with a stop at Circus Circus or Afros Chicken for a quick bite before continuing. 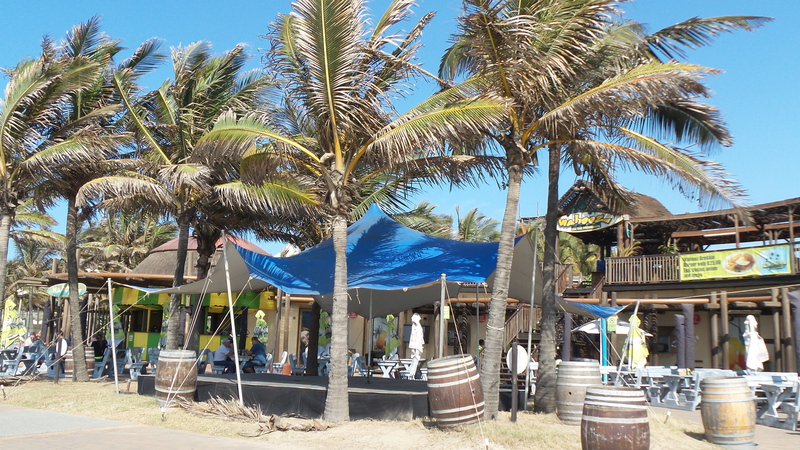 Wahooz on the uShaka end is a beachside bar with lively Saturday or Sunday afternoon music featuring local bands like, Afritude or Sizamo. THE CITY: Propertuity, the same people resonsible for the “Maboneng Precinct” in Johannesburg and their vision of promoting a hub for creativity, lifestyle and culture in the city has ignited a reincarnation of the CBD. Their brainchild ” Rivertown” is set to transform the face of the city. The Morning Market and the Beerhall are already firm favourites. 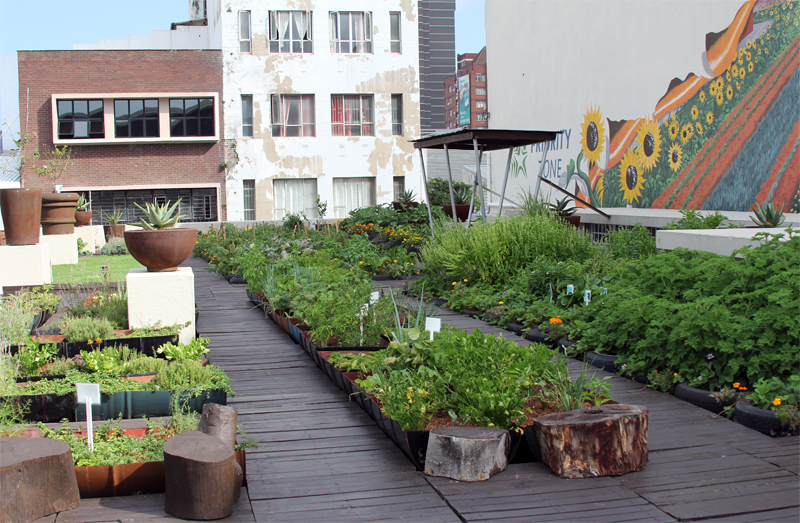 Unexpected spaces are being developed to create urban food farms, such as the one in Monty Naicker Road. The rooftop’s organic vegetables are being sold to local restaurants such as Corner Cafe or given to soup kitchens. This beautiful area has been used as a pop up restaurant popular duo Zak and Tonic during the recently held UIA2014. 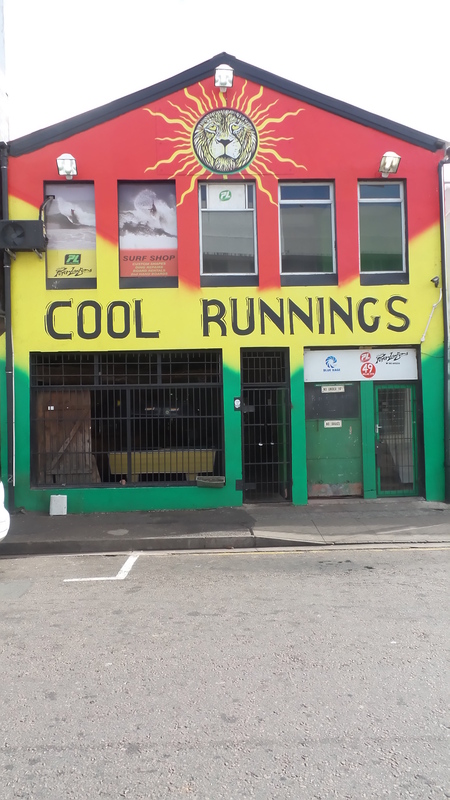 Cool Runnings, a popular Durban bar has also created a “Pocket Park” against a backdrop of a massive wall of street art where food, medicinal and other indigenous plants are grown. Colourful recycled outdoor furniture is set up in the park during the day so that people can meet, relax and socialise. 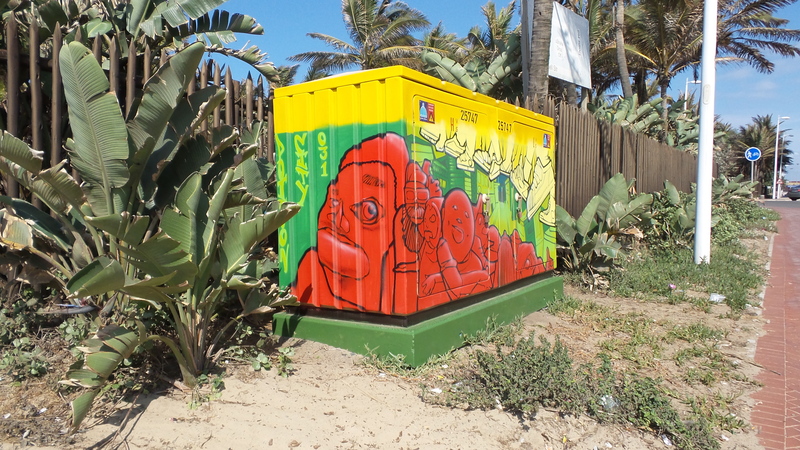 Take a stroll down Dr. Pixley Kaseme street, the old West Street, toward the beach end and find yourself transported into a green oasis with benches along the side of the road, where the street has given way to areas of relaxation with colourful benches. There is often live music in the evenings and it is easy to forget that you’re actually in the middle of a city. Florida Road, long a meeting point for the hip and happening crowd still remains hugely popular, but the new kid on the block is no doubt Mackeurtan Avenue in Durban North. Suburbia is no longer just the domain of housewives , this tree lined road in the North is lively, with great restaurants such as Spiga D’Oro and Wok Box, Earth Mother Organic and Connors Public House with its Wednesday night karaoke all taking up residence here. Not forgetting that just around the corner is the critically acclaimed Greedy Buddha . Kung Thai and various other eating places are also nearby. Pop over to Glenwood which has carved out an identity for itself amongst the trendy crowd. The KZNSA Gallery ,the many antique shops and great array of restaurants and cafes in the area have contributed to its revival. Many of the old Victorian style houses have been converted into trendy eateries and boutiques and Glenwood has a very similar feel to Melville in Johannesburg. While you’re there a must is The Glenwood Bakery, there artisanal breads are too die for. The Factory Cafe is not too far off and well worth a visit. I’m sure you are wondering why we have not mentioned The Big Swing at Moses Mabhida stadium or Gateway for shopping or even Umhlanga village, well, this is by design. 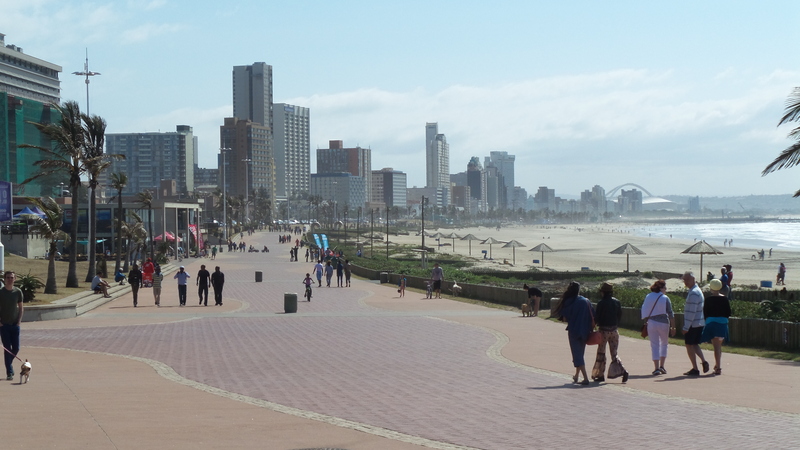 We wanted to share with you Durban as we experience it, the tourist areas and sights are well known and publicised but to get a real feel of Durban, you have to do as the locals do. 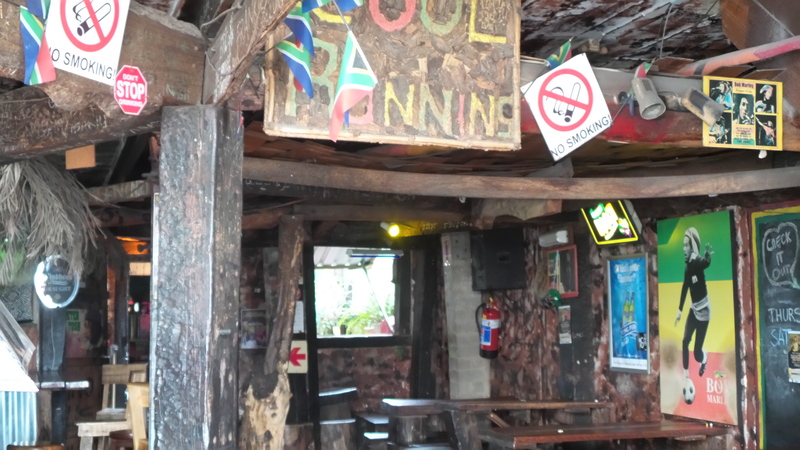 But please don’t forget to make a visit to Max’s Lifestyle in Umlazi, this is a township experience not to be missed. Enjoy a leisurely Sunday afternoon ‘braai’, where you don’t have to do the work and allow yourself to be transported into the rythmn of the kasi. This is Durban!!! The Warmest Place To Be!! This entry was tagged beach, chefs, city, Durban, fishing, KZN, local, markets, sailing, sea side, South Africa, sun, surf, the warmest place to be, Travel, zulu kingdom. Bookmark the permalink.